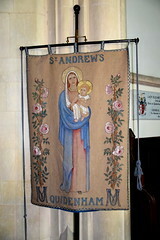 Quidenham is a small village to the south of Attleborough, known throughout East Anglia because it is home to two significant institutions, the Carmelite convent and the Children's Hospice. 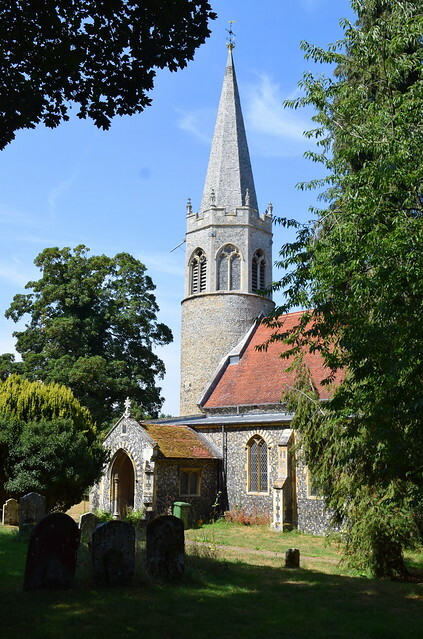 St Andrew's Saxo-Norman tower has been augmented in an elaborate fashion, a tall early Perpendicular bell stage topped off with the drama of a spire. 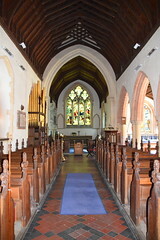 It goes to make the church appear larger than it actually is, particularly if you approach from the south and see the 19th century aisle on this side. The buttresses on this aisle have flushwork monograms set into them. 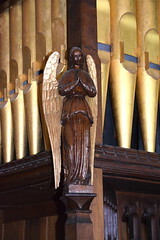 It is easy to assume that they are Victorian conceits, but I wondered if Mortlock might be right in suggesting that they are genuine medieval features reused from elsewhere. 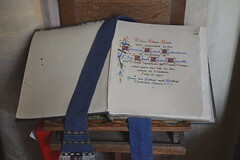 I wondered even if they were perhaps from the base course of a square tower at another church. There is an aisle, but there is no clerestory, and consequently St Andrew is rather dark inside. However, it is not gloomy, because the windows are filled with richly coloured glass of the late 19th and early 20th centuries. 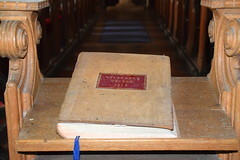 Those at the east and west ends of the aisle are lighter, creating a space which is less dark than the nave. 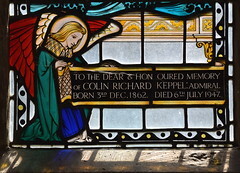 Around the walls, memorials, as well as several of the windows, remember members of the Keppel family of Quidenham Hall. 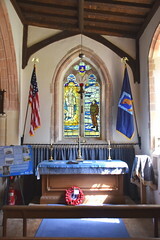 The most memorable is probably the 1947 American war memorial window in the aisle by Michael Farrar-Bell, depicting a WWII airman looking up at a vision of Christ. 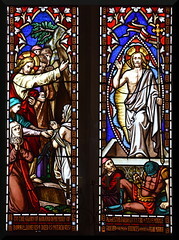 The window near it of Christ summoning the disciples is the better of the two, and also dated 1947. Was it part of the same commission? 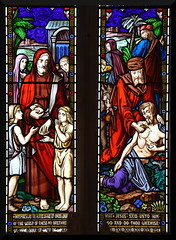 Other glass here by the O'Connors is good, although Heaton, Butler & Bayne's east window is perhaps not their best. 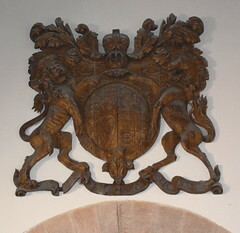 Overseeing all this colour is an austere carved Stuart royal arms above the tower arch. 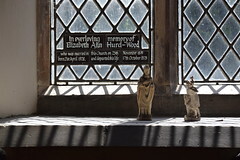 Perhaps the most moving survival in this beautiful church is a recent one. 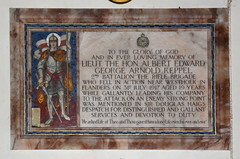 This is the memorial to Albert Keppel, who died in July 1917 while gallantly leading his company to the attack on an enemy stronghold in Belgium. He was just nineteen years old. The memorial features a gilt mosaic of St George, and above hangs the helmet that he was wearing at the time. By the summer of 1917, the First World War had become a disgusting affair, an industrial process. The fields of Flanders were no longer host to romantic charges into rifle fire, but to tanks, land mines, flame-throwers and poisonous gas. Young Albert must have been just sixteen when the War broke out. What must it have felt like for his parents to have lost him in this way? I think of my great-uncle Harry Anable, also just 19 when he was killed during the first few minutes of the Battle of the Somme a year before Albert Kepple. Harry was just a frightened private, the son of a farmworker, but the shadow of his death hung over the family into my lifetime. You can't think back to the mindset of the First World War, of course. The event, and the times that surrounded it, are beyond imagining. The whole thing is numbing, too enormous for grief. It isn't the large numbers that tear the heart, it is the individuals, and they are almost without number.